Today Bugaboo is sponsoring the Sentimental Sundays Challenge which means that if you play along with SSC, you could win fabulous Bugaboo images! The theme of the Sentimental Sundays challenge this week is: Blue, Snow and or glitter! I used one of Jodie's new AKV Snowmen "Snowman Scarf" along with some snowy, glittery paper I got on a recent trip to Archivers. I hope you'll play along in the Sentimental Sundays Challenge. I'd love to see what you create. Fabulous card. Nice background paper. I love these snowmen! I haven't colored any of them, and I'm going to blame our un-seasonal weather for my lack of snowy-mojo! lol! Super cute, Lori! 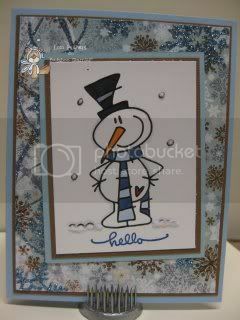 How sweet... these snowmen are adorable! How can you pick one??? - lol. I am late in joining in Sentimental Sundays this week, but just made it. And had to stop by to say hi.